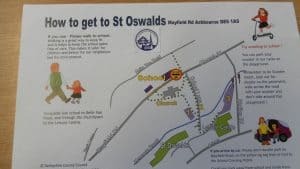 At St Oswald’s we encourage our children and families to find fun healthy ways in which to travel to school. Our School Council and Travel Plan team work together to encourage fun, safe and healthy modes of travel. Keeping our children safe as they travel to and from school is essential. Each term we take part in the “Walk to School Week”. We hold an annual scooter safety club, Balance Bikeability for our youngest pupils and Cycling Proficiency for our oldest pupils. We work in close conjunction with the local PCSO’s in the community. We hold regular Lessons on Safety linked to the “Green Cross Code.” and are very lucky to have a School Crossing Warden. Our School Travel Plan can be accessed in school and is available to look at. We have received the “Bronze Award” for our work on our Travel Plan. Click on the document below to look at our travel plan in more depth.